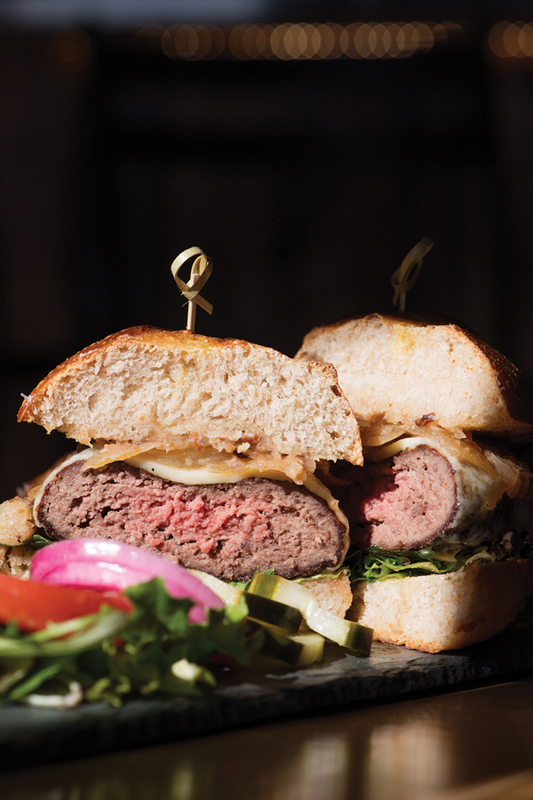 The grass-fed burger, on a Maine Grains brioche bun. 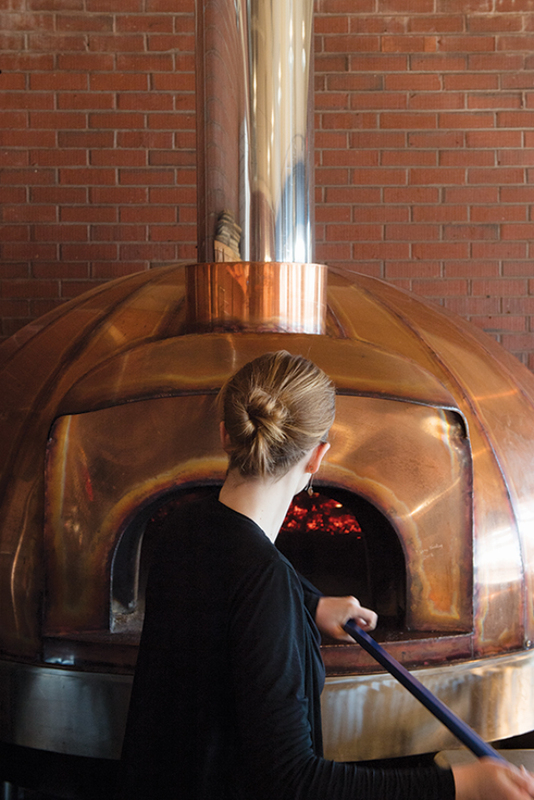 A shiny new pizza oven and a pubby vibe are heating up the old county cooler in Skowhegan. 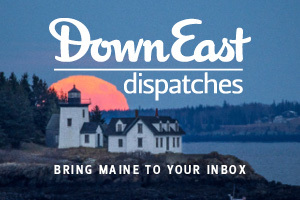 The Somerset County Jail, in Skowhegan, housed local reprobates from 1897 to 2008, but for the past decade, its cellblocks have been turning into business incubators. There’s a radio station and a dry goods store. There’s a yarn shop, the handrails outside covered in intricate woven patterns. And most of the three-story brick-and-steel building now serves as the production facility for Maine Grains, a certified-organic grain mill that sells to shops and restaurants from Aroostook County to New York City. On my first visit, twinkling lights on the patio — formerly the rec yard —­ lit the faces of dozens of fleece-clad patrons clustered around fire pits. 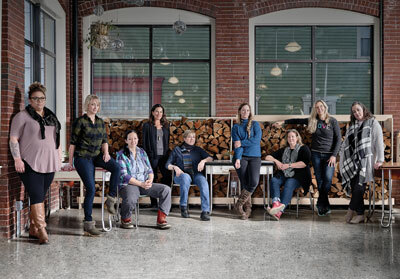 Inside, a half-dozen tables, including the communal “miller’s table,” were snugged between a reclaimed-wood bar and three garage doors that once lifted to admit new inmates. In the corner stood a gleaming copper oven, handmade by Maine Wood Heat Co., also in Skowhegan. It uses refractory terra-cotta tiles, imported from France, to lock in the wood-fire heat at 900 degrees. 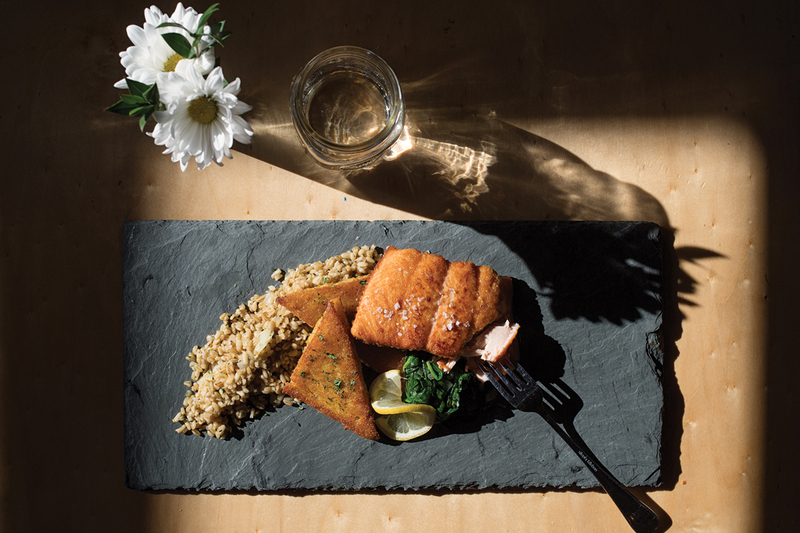 Oat groats and polenta triangles with pan-seared salmon; the Cayford, with local apples, sausage, and caramelized onions; many-windowed garage doors flood the dining room with light; even the restaurant’s copper pizza oven is Skowhegan-made. At the mouth of the oven, laughing teenage pizzaiolos slung pie after pie. The dough they use comes from across the street at the Bankery, a bakery inside a former bank. Lambke sells grains to the Bankery, and the Bankery — using a lightly tart sourdough starter instead of instant yeast — makes the dough and sells it to Lambke. 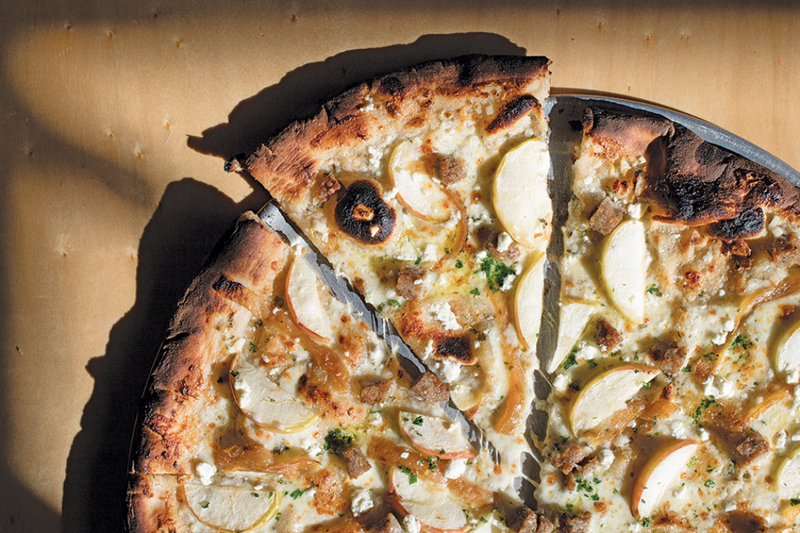 The teens turn out plenty of pepperoni pies, but the menu also includes options like the Cayford, topped with white sauce, local fennel sausage, sliced apples from nearby Cayford Orchards, caramelized onion, and crumbled feta. Crusts are paper-thin, blistered and blackened in spots, and rise into airy and chewy brims. They’re terrific — not just perfunctory vehicles for cheese and meat.  42 Court St., Skowhegan. 207-612-5322. Starters $6–$15, pizzas and entrées $10–$22. In the morning and afternoon, the Miller’s Table dishes up a pared-down counter-service menu for eat-in or takeout. 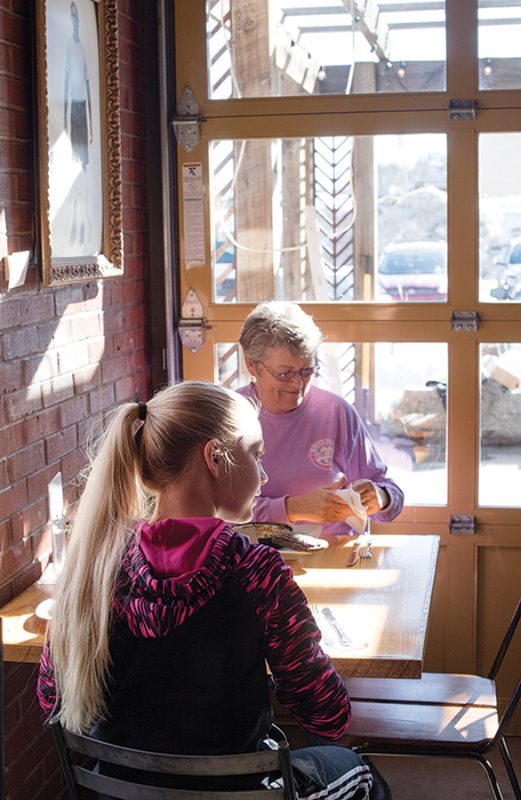 Some of the high-schoolers working the pizza oven got hooked up with their jobs during Pizza with a Purpose, a fundraiser for local schools that the restaurant hosts. A warm dish of garlic-and-onion–accented mixed nuts is a nice start with any of the Maine beers on tap, including Allagash, Bissell Brothers, and Orono Brewing offerings (fun fact: all three of those breweries have used Maine Grains products in their beers). I set out to land as many carbs as possible at my table: crunchy-at-the-edges, chewy-in-the-center focaccia with cloves of roasted garlic, plus yeasty biscuits topped with salty butter and an assortment of chutneys. I even ordered an apricot scone, studded with candied chunks of fruit and glazed with sugar, right in the middle of my meal, because I’m an adult and I can do what I want. Small-town life seems to have a way of organizing itself around unofficial community centers where friends can banter and swap stories. In my midcoast village, population 2,000, it’s the backyard of whichever neighbor most recently put on a new deck. Some towns it’s the corner table in a dusty general store, and others it’s the accounts-receivable office at the heating-oil company. In Skowhegan, it just happens to be the former clink. 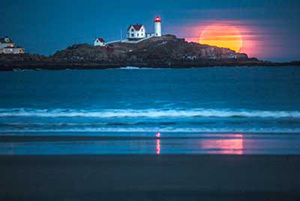 Malcom Bedell is the co-author of Eating in Maine and blogs about midcoast eats at Eat Rockland.